One of my favorite parts happened next, when the rabbi welcomed us to the temple and said it was a time to celebrate and worship without cell phones and all the distracting techonologies that vie for attention in the outside world. I thought it was a lovely way to remind people, “Turn off your cell phones!” But he really meant it. Later on, he kindly asked that those who were taking photographs stop and put down the cameras and the phones. He truly wanted us to savor this ceremony in its moment. I fumbled my way through the prayer book that gave the order of worship and felt like it was most similar to the Catholic prayer books that I’ve never quite figured out either. But this one opens at the “back” and flows from the back to the front, which made sense when I remembered that Hebrew is read from the right to the left. The rabbi and cantor were quick to say which page we should turn to, and for at least part of the time, I could figure out where I was supposed to be on a given page. Our friend’s son gave a short lesson (or sermonette) about the passage he was going to read from the Torah, and he shared with us some of his passions: stopping gun violence and helping victims from the recent tornadoes in Oklahoma. I want you to stop for a moment and think about the 13-year-old boys you know through friends. How often do you get a glimpse beyond the video games they play or the sports and other hobbies they love to see that they care deeply and passionately about what’s going on in the world around them? This Bar Mitzvah gave me an insight into this sweet young man that I might not otherwise have. What a blessing to hear him speak of what is on his heart and to hear him read scripture and to hear him pray a prayer of thanks to God for those people who are most important to him. To bless the Torah reading before and after each section, relatives came up to surround the boy with their support and their voices. It was heartfelt and clumsy and silly at times, but the loveliest moment of all came when the parents stood up next to the boy and told them not just that they loved him but why they loved him. They spoke of his qualities and talents and passions and goals, and they gave him beautiful words of encouragement and support. This is not something I have ever experienced before in Christian ceremonies (maybe an occasional father of the bride at best). I cannot imagine what it feels like to be at the brink of a very difficult life transition – becoming a teenager – and hearing what your parents most love about you and hope for your future. Declared publicly. In front of family and friends. What a blessing, and what a way to strengthen and connect with family during difficult, trying years. Sitting there in the temple, I wished this ceremony for every child growing into adulthood. More specifically, I wished that the Christian confirmation ceremony could be more like a Bar Mitzvah, stretching young people by inviting them to read from the Bible in front of the congregation, share what they care about most, and then publicly hear and receive a blessing from their parents. I came away from the weekend wanting to know more about Jewish traditions and ways of being a community with one another, wondering if there were additional practices Christians might adopt to strengthen our own families and our communities of faith. On Monday, I heard my own yearning echoed in the voice of a rabbi on the radio talking about a Torah scroll that had been brought here from a Czech town the rabbi thought had been destroyed by the Nazis. The town survived, and the (mostly Christian) residents have rebuilt the synagogue that was there. The interview piqued my interest even more when the conversation turned to how Christians and Jews can learn from each other’s traditions: “The Jewish roots of Christianity simply must be … understood more deeply so that the resonances between the faiths are clearer. I do think that we could evolve to a place where we are … partners in bringing redemption to the world.” If you have time, listen to the interview. Do you agree with her? I could surely name what I felt at this weekend’s Bar Mitzvah as a “resonance” between the Jewish and Christian faiths. I’ll leave you with a few questions: What resonances between faiths have you experienced? If you’re a Christian, do you think there’s room to bring in Jewish traditions such as the Bar Mitzvah to the Christian church? I’ll also leave you with a few photographs I took on my visit to the museum this morning (where I also discovered the John Singer Sargent painting). 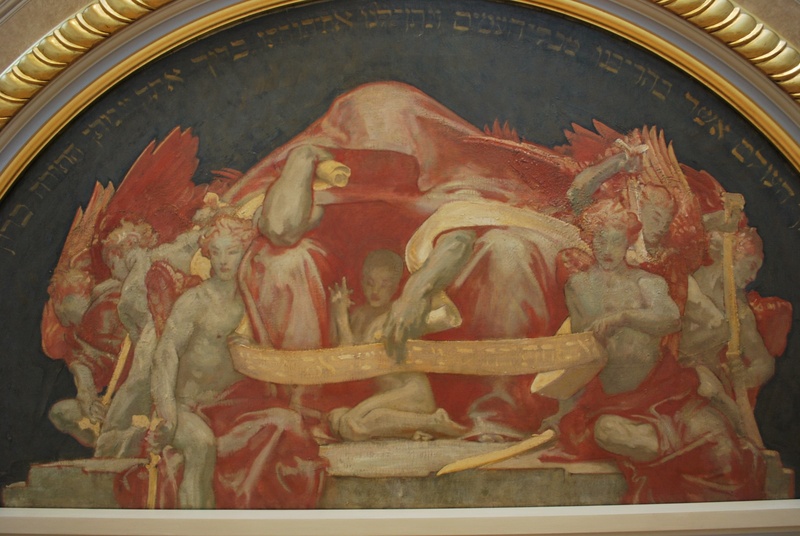 I went specifically to revisit our Judaic art collection and understand better some of what I saw in the temple. 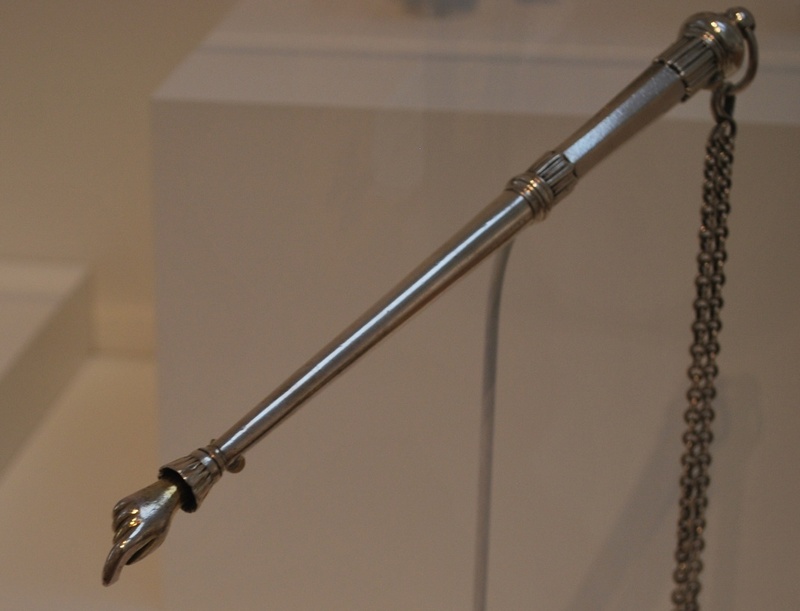 A Torah crown, mantle (the cloth), shield and pointer. There is a large ark at the front of the temple that houses the Torah in scrolls adorned and protected in this manner. The decorations range from modern as seen here to quite intricate and ornate, as seen below. Here you can see the actual scroll, typically made of vellum. 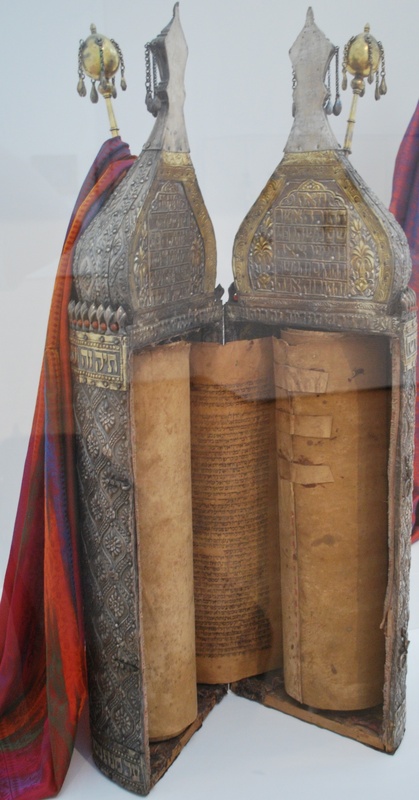 Because they can be old and fragile, Torah scrolls will often have a pointer so that the reader doesn’t have to touch the scroll to follow a line of text. A quote on the museum wall. Another resonance for me and a reminder that Jews and Christians alike have a common goal as we preserve and share our faith with others. This entry was posted in flourishing tree and tagged Bar Mitzvah, Christian ceremonies, community of faith, faith traditions, family, Jewish ceremony, john singer sargent, mezuzah, religion, teenagers, Torah by hopesquires. Bookmark the permalink. I think we can learn from our similarities *and* our differences, too. I agree with you that it’s easy to forget Christianity’s Jewish roots. The first time I went to a Synagogue was in 2006. My spirit felt so complete by attending a Synagogue on Friday and ESUMC on Sunday. I’m glad you enjoyed your experience in a synagogue. Do you think you felt more complete by going to both types of services than just one? Or maybe it was an especially holy experience at both that particular weekend that made you feel complete. My childhood best-friend is Jewish and through her I was able to celebrate many of the wonderful Jewish traditions and she mine. When we married, I was honored to be her maid of honor and learned the role (and Hebrew prayers) I was to play in her conservative Jewish ceremony. In retrospect, it was a very big deal that I was a non-Jew in this very big and special wedding. The rabbi was wonderful and made sure that I was included at all times. My friend was my matron of honor when I finally got married. She said the Lord’s Prayer and went to communion to receive a blessing and like me was made to feel welcome by our Episcopal priest. We are all one under God. Thank you for sharing this story. The Bar Mitzvah was at a Reformed Synagogue, and I wondered if that was why the rabbi and cantor were so welcoming, but I’m glad to hear you felt included and welcome in a conservative ceremony. How wonderful to experience each others’ faith traditions growing up and sharing each others’ happy day in such special ways.